Social Media (SM) engagement by medical professionals is increasing. Variation is noted in engagement between SM platforms and between surgical specialties and geographical regions. We aim to study SM engagement by colorectal surgeons attending an international conference. Surgeons were identified from the delegate list of the 2017 Annual meeting of the American Society of Colon and Rectal Surgeons (ASCRS) and Tripartite Meeting (Seattle, Washington, USA). Delegates were searched on Twitter and LinkedIn for the presence of a matching profile. SM presence, activity, gender and geographical region were analysed. 270 (13.2%) surgeons had Twitter accounts, 994 (44.3%) had LinkedIn profiles. UK surgeons were more likely to be on Twitter than surgeons from elsewhere (23.4% vs 12.7%, p = 0.0072). Significant variation in social media membership between each geographical region was noted, with usage rates for Twitter of 18.1% Europe, 14.4% North America, 12.9% South America, 4.3% Oceania, 3.7% Asia, 0% Africa. A similar picture for LinkedIn is seen. The #ASCRS17 meeting saw the highest participation of users to date (979 participants, over 7,000 individual tweets, and nearly 14 million impressions). 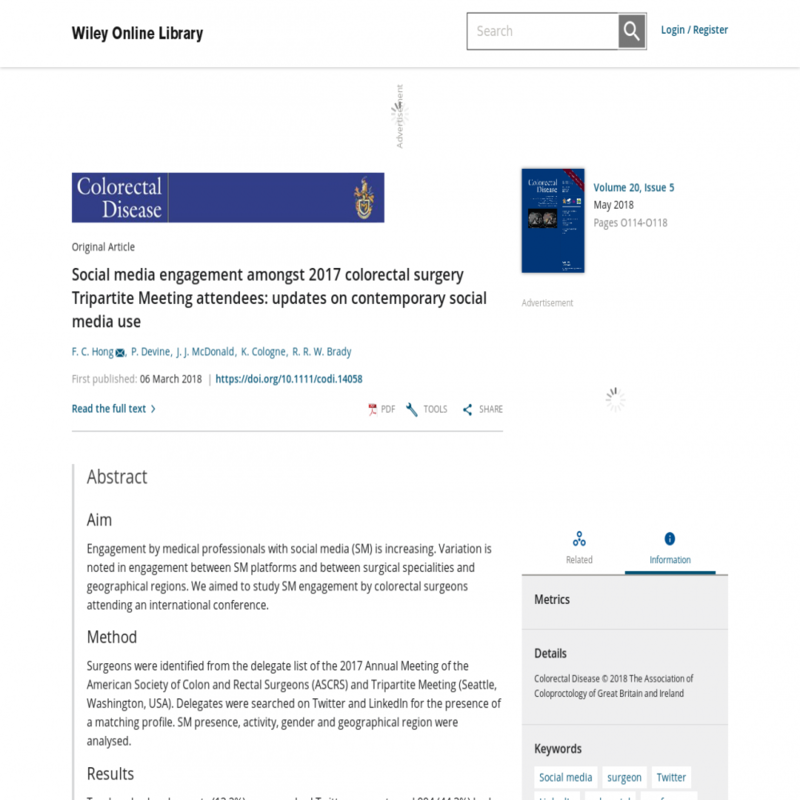 SM engagement by colorectal surgeons continues to increase. Significant geographical variation is noted, suggesting SM's unique potential in education and networking may not yet be widely appreciated globally. Future work should include further analysis into tweet contents to gain insights and optimise the use of SM as educational adjuncts. This article is protected by copyright. All rights reserved.